Textile Design / Visual Communication. We Are Here, my degree collection, is inspired by Cumann na mBan and their involvement in the fight for independence. Another area that inspired my collection is the Ireland that we have now where continued austerity, government cuts and new charges have brought Irish people out onto the streets to protest and make their voice heard. The concept is not melancholic or anger but more to do with how we deal with what we have now. I have developed designs based on and including traditional craft techniques like letterpress printing, screen printing and weaving. I wove 6 meters of wool on an AVL Dobby Arm loom. I felted the weave before I cut out the pattern pieces for the coat. My visual inspiration comes from Dublin city and the secrets it holds like the bullet holes in the Royal College of Surgeons, names scratched into walls and old signage from businesses long closed down. 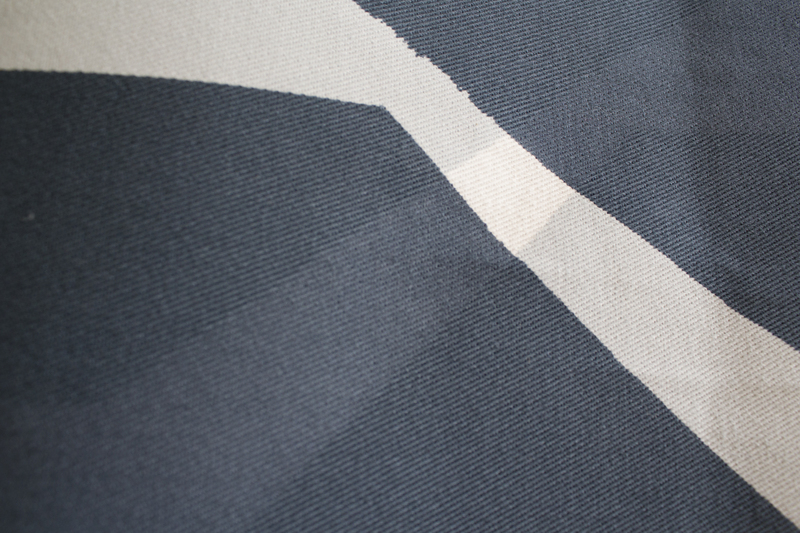 The fabrics that I used are mainly natural including cotton, linen, wool, canvas and Tyvek. I printed my designs through screen printing and digital printing. The processes I incorporated into the screen printing are reactive paste, pigment, metallic foil, puff, devore, and 3M reflective beads. 7,000 Times a Minute* is a book on tattooing in Dublin. 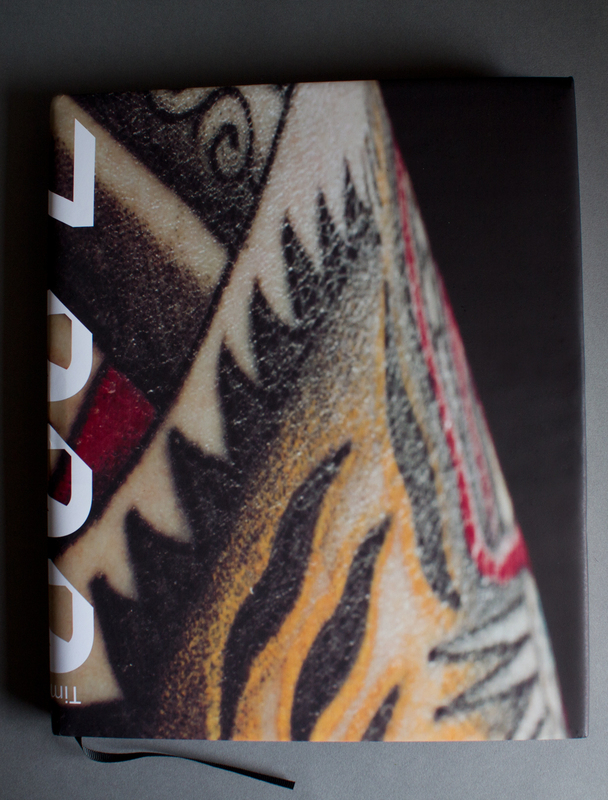 The book includes information on how tattooing works, interviews with people with tattoos and a photographic documentation of tattooing from start to finish. * A tattoo needle enters approximately 7,000 times a minute. 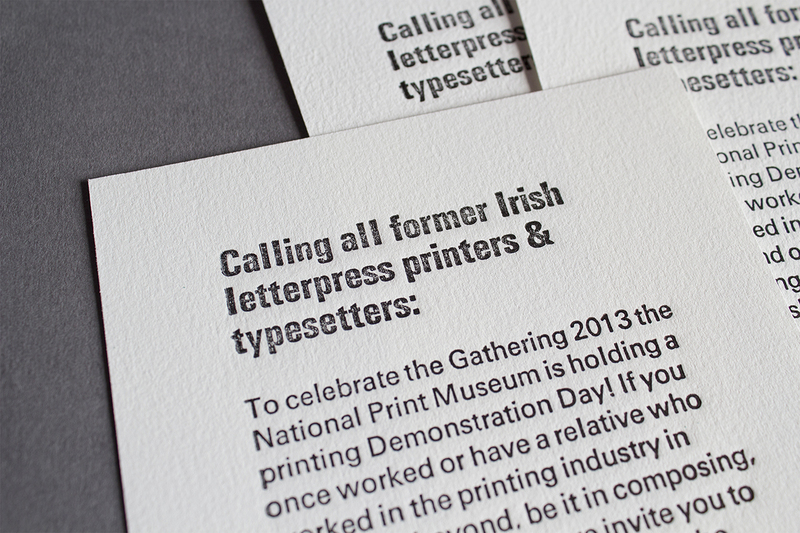 Poster and invitation for the National Print Museum’s Demo Day as part of the Gathering 2013. All material was set and printed in the National Print Museum. 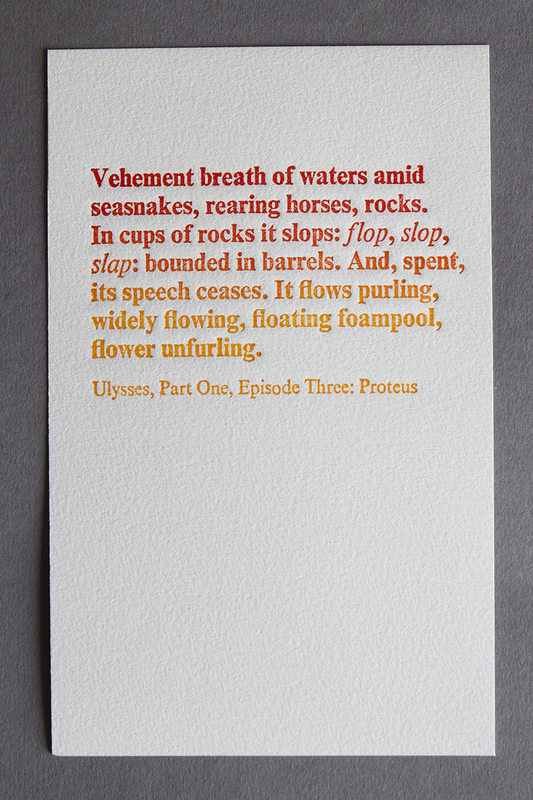 A souvenir print typeset and printed in the National Print Museum for Bloomsday 2013. Visitors were invited to print their own copy to take away. A collection of screen printed fashion fabric samples for Spring Summer 2016. The concept for this collection is based on the history of my family’s plot in Mouds Bog and the ban on turf cutting in private plots across Ireland. Fabrics used include cotton and silk. Processes include reactive paste, hand dying, devore, metallic and pigment. 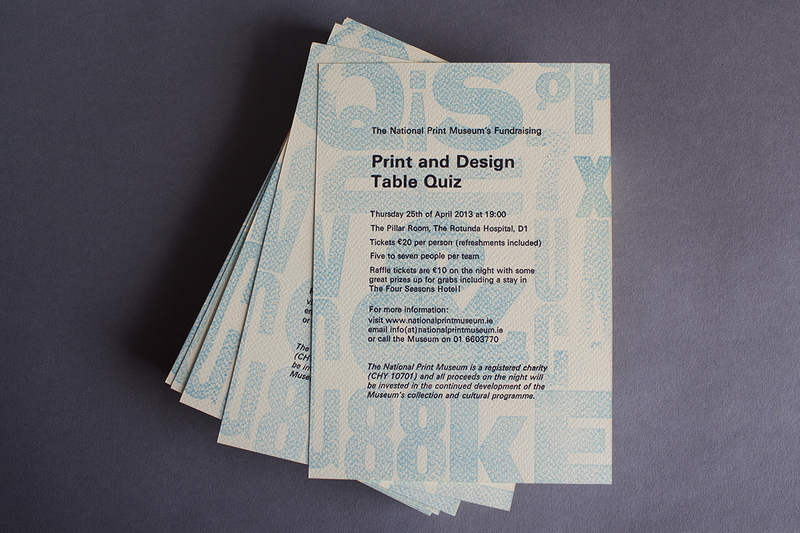 Invitation, bookmarks and table numbers for the National Print Museum’s Print and Design Table quiz fundraiser, April 2013. All material was set and printed in the National Print Museum. 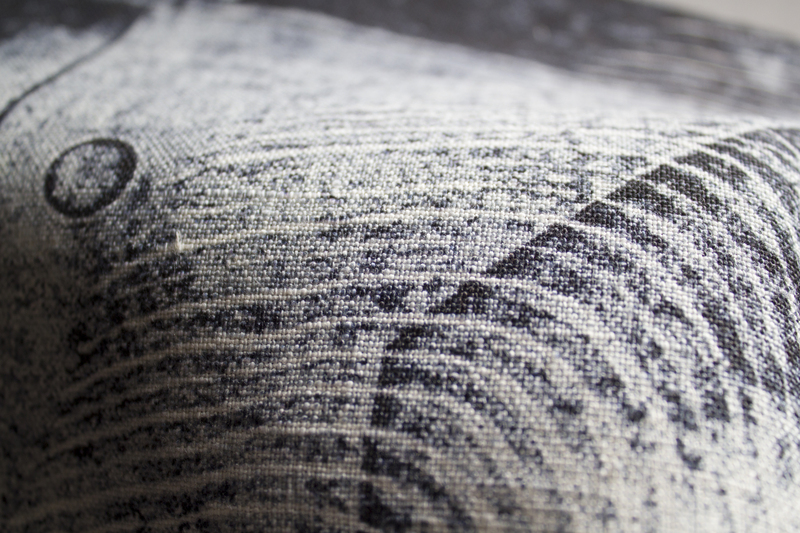 A selection of screen printed and digitally printed interior fabric samples inspired by modular design. The samples were designed for light treatments, upholstery, cushions and curtains. Fabrics include linen, cotton, velvet and roman devore. 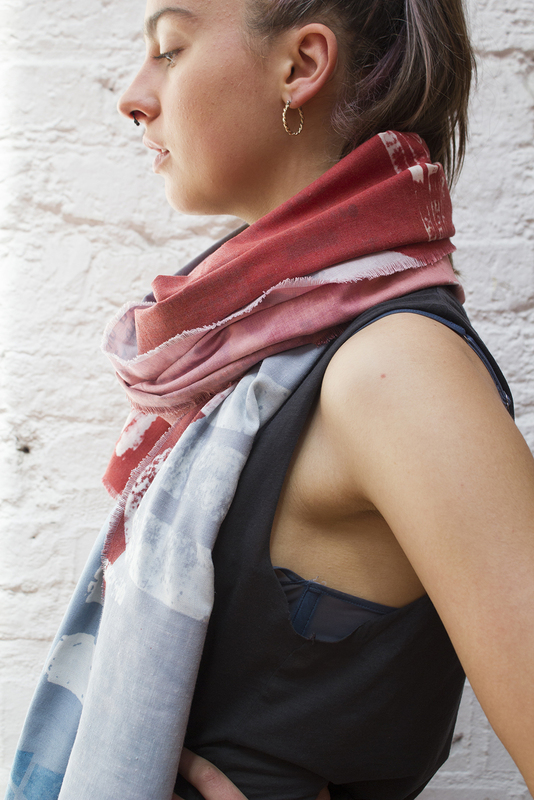 Processes used include hand dying, pigment, etch, devore and digital print. Wood and metal type poster typeset in the National Print Museum. 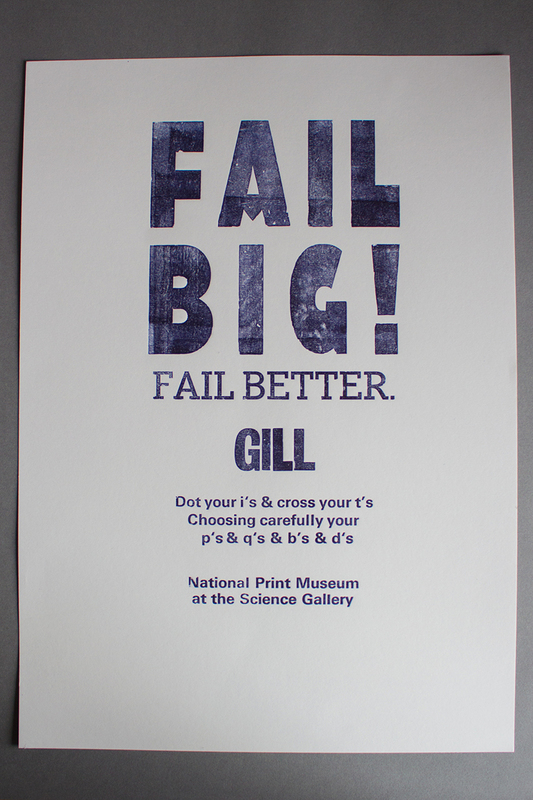 The poster was printed in the Science Gallery by members of the audience for their Fail Big event, part of their Fail Better exhibition. The audience member set their name into the poster without any guidance creating an individual keepsake of the night.